It never ceases to amaze me, the many treasures that are in the collection at the Thames Museum. The exhibits are always worth a visit. Whether it be the models of famous buildings around the old town, the shops, house displays or the crockery items. Plus many more quality items. When you visit, time should be taken to view the photographs available. If you have a specific area of interest, mention it to the staff who will probably be able to find something of note. 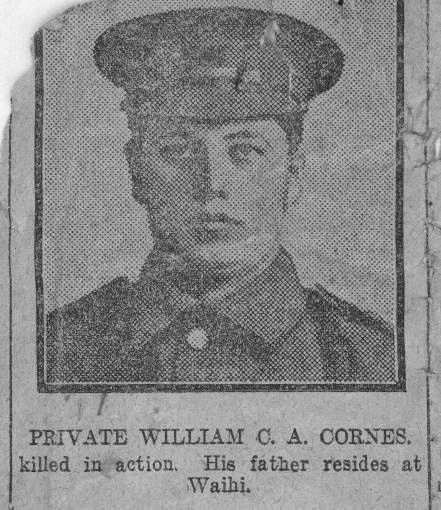 Today I was looking at the World War One photographs and also viewed many relating to the early militia groups in the town. One example is of the 1910 Thames Rifles team that won the Kenny Cup. 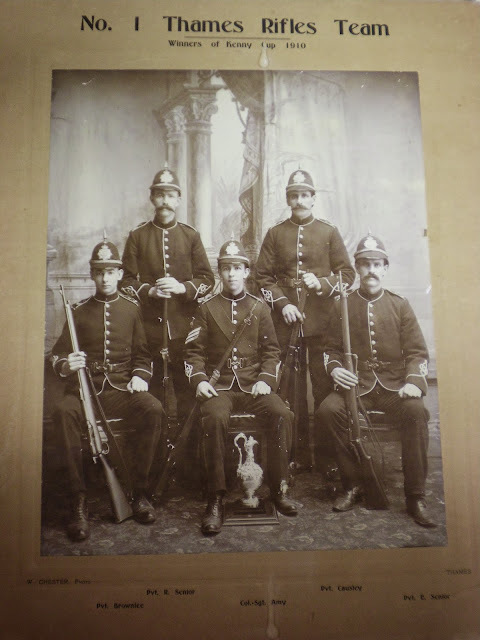 The men are: Back row Private R Senior, Private Causley. Front Row Private Brownlee, Col-Sgt Amy and Private E Senior. The No 1 Thames Rifle Group feature in many shooting competitions around 1910. And there are a number of cups mentioned, including the Ensor Bros and Roger Cups. Color-Sergt Amy makes several mentions regarding his excellent shooting results. The newspapers reported the 1910 shooting Kenny cup result, and in 1911wondered if anyone would be able to displace the Thames team? A new theme looking at news and events of one hundred year ago. Benefit night: Money was raised to help the treatment of Miner's Complaint, a magic performance held at the King's Theatre by Mr McEwan. 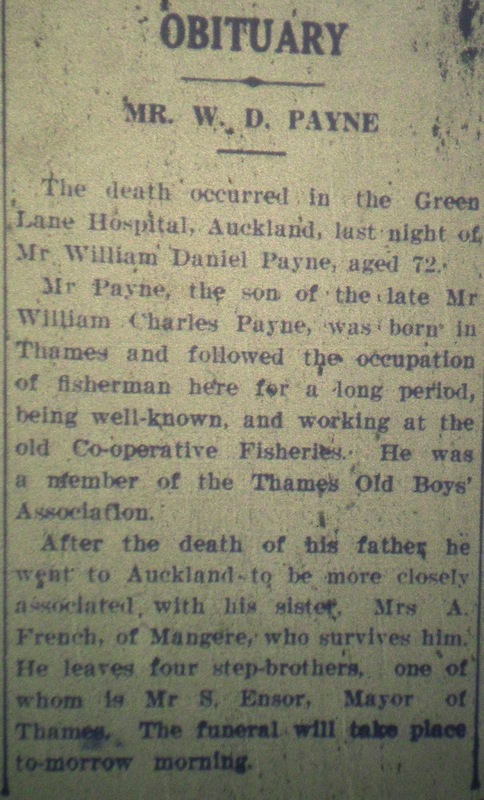 Holiday News: Miss Myrtle Trotter had returned to Waiomo after a holiday in the Thames Valley. Baking: Edmonds were giving away a free cook book to anyone that wrote in! Hotel News: The Cornwall Arms Hotel had a new publican. 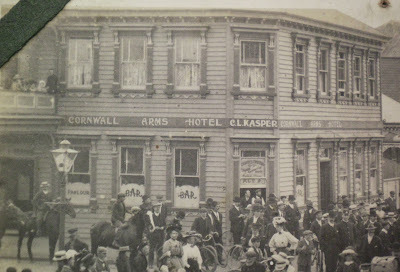 Mr Samuel Kahn had taken over the hotel after experience at Thames and Auckland. Phone number 98. Below is a photo of the Cornwall Arms Hotel (now the Workingmen's Club, on the corner of Pollen and Cochrane Streets, Thames. This photo was just a few years before Kahn took over, c1907 when C Kasper was in charge. It's a beautiful day in Thames, just what is needed for the new concrete entrance path at The Treasury. Remember if you are coming to Thames over the weekend, the research rooms are open on Monday. Above: The view through the Archives from Queen Street - The School of Mines can be seen through the back window. Another attraction that is well worth a visit. There were many billiard rooms in Thames, from the time the goldfields opened. Hotels like the Brian Boru boasted a fine, top quality, full size table. Private saloons continued on and were still in existence into the 1960s. The one on the right was George Cosgrove's 1940s-1950s, located just north of the Pollen and Walter Street intersect. 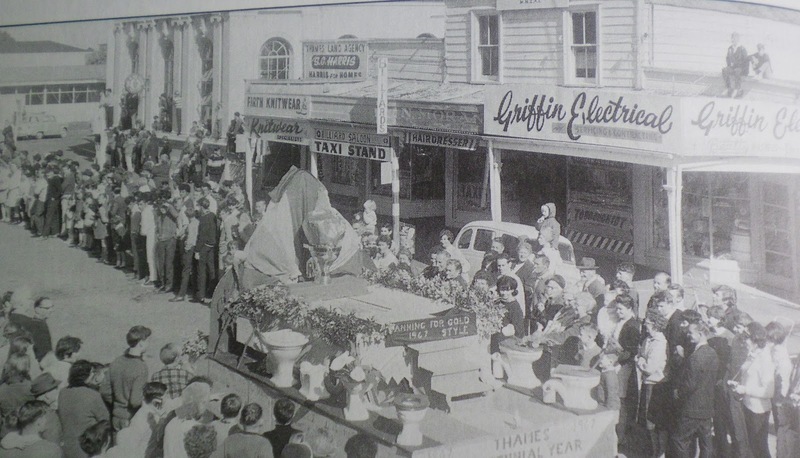 1967 Centennial Parade, the Billiard Saloon sign can be seen above the TAXI STAND sign. This is just north of the Bank at the corner of Pollen and Sealey Streets. The Billiard Saloon in the photo above was owned by R Hignett in the 1942-1950 Street Directories. Then the owner was Bart Willoughby in the late 1950s. Information on billiards at Thames is contained within many of the oral histories at The Treasury, including mention of representative players. 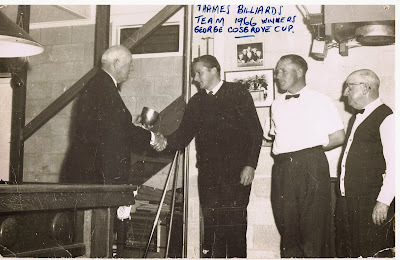 Below is the 1966 Thames Billiards team, that won the 1966 George Cosgrove Cup. From the right: Fred Cornes, B Senior and C Sutcliffe. As a child, there was nothing more exciting than walking the corridor to take a sneak at the billiard tables and the games in progress. A new blog on the block, that covers 'DEAD CERT' articles by Meghan Hawkes of Thames. Locals will remember Meghan's articles in the local newspaper - covering an insight into the lives of the people of the Thames-Coromandel area. Ever wondered about the people behind the names? Many of the gravestones are in a terrible state, but truly remarkable and amazing stories exist of the early settlers. Meghan brings these tales together and helps us remember the past residents of The Thames. The first blog is entitled: Demoniacal possessions. 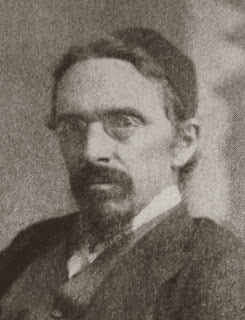 George Maxwell, 1879. A doctor mentioned in the article was Dr Payne, his photo is below. Below is a view of the rooftops from Broad Street, of the two buildings that make up The Treasury and the new Archives building. Above: View from Broad Street. Looking across the Waiokaraka Village (old Waiokaraka School site), over Pollen Street to the Treasury (old Carnegie Library) with the Archives building to the left. 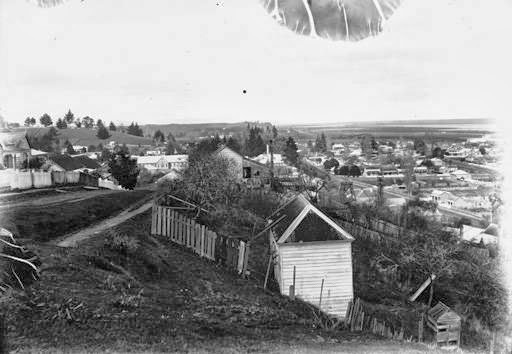 Below is a reminder of the past, from further north looking across at the Queen Street & Cochrane area. 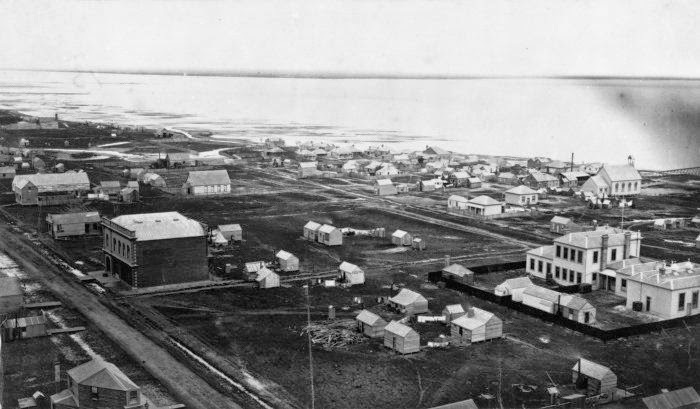 The Wesleyan Church marking the site of the present School of Mines. Pollen Street on the left and Queen Street on the right running past the Government buildings. 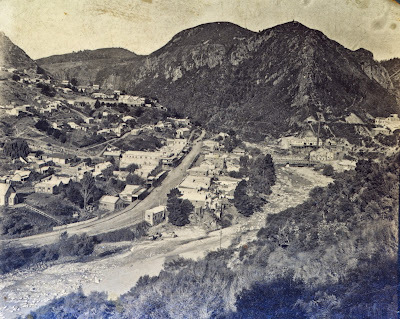 When mining started on the Ohinemuri Goldfield, many miners from Thames went south towards Paeroa, Waihi and Te Aroha - ever hopeful of the riches that gold promised. At the least they hoped for regular employment in the big mines that were established. From the late 1870s onward, many of our Thamesite families settled in these areas, while some stayed many would later return to Thames and find alternate employment. Looking at the Karangahake Reserve area today - it is hard to believe that this was once a busy, bustling mining township. Karangahake is situated on the bank of the Ohinemuri river. The main road to Waihi passes through the township. On the opposite side of the river are the batteries of the New Zealand, Talisman, Woodstock, and New Zealand Crown mines. 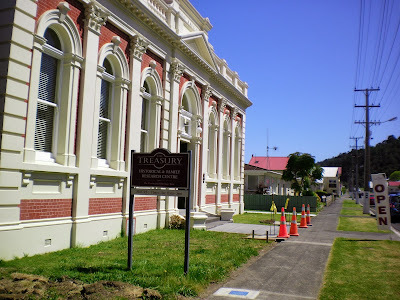 Like Waitekauri, Waihi and Waikino, Karangahake is under the jurisdiction of the Ohinemuri County Council. 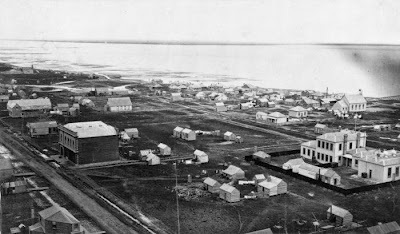 A street water supply has been laid on, and the township has a public hall, two hotels, and a fair number of stores and business places. Numerous coaches run daily through the township, which is situated in a gorge formed by the Ohinemuri river, the hills on each side being close and fairly high. Karangahake is five miles from Paeroa, and four miles from Waikino. 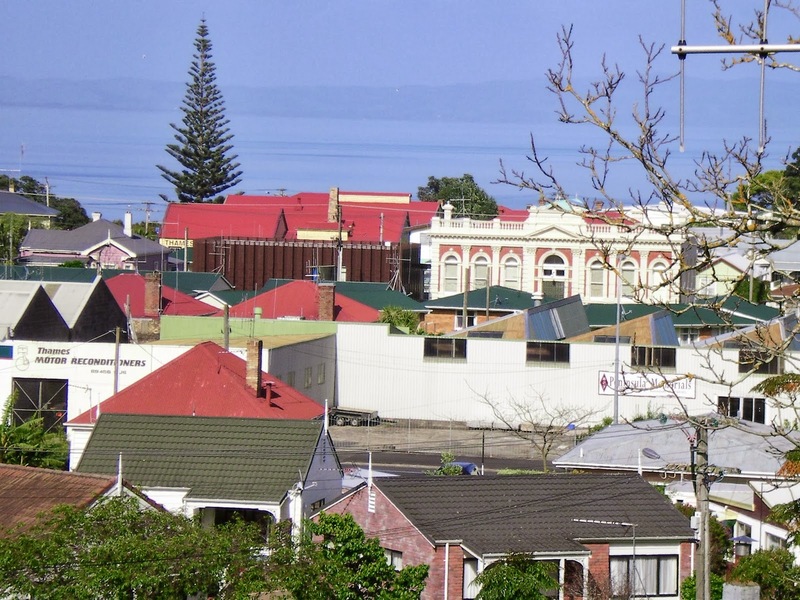 The area is busy today with holidaymakers and tourists, who can pause and enjoy the heritage walks in the area. Special thanks to Lloyd for sending some photos that will be passed on to The Treasury in Thames. A reminder to all, if you have some old photos of the Thames area - please consider sharing a digital copy or taking them in so a copy can be made. A great view looking at the western side of the old Waiokaraka aka Central school that was in Cochrane Street, Thames. 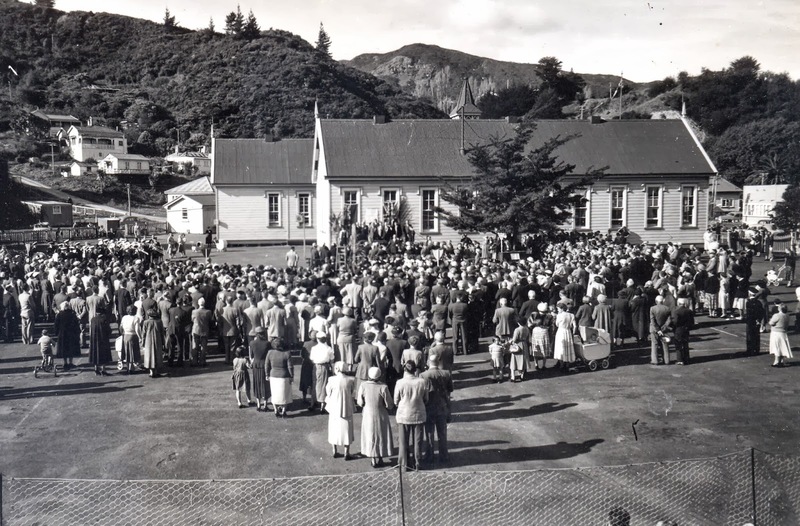 What a grand old school it was - the area now the site of the Thames Historical Museum and the Waiokaraka Retirement Village. 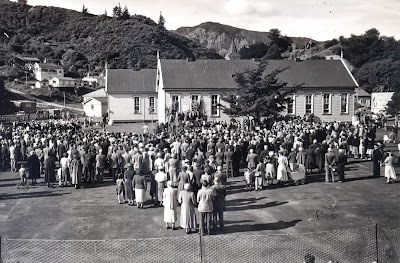 This photo was taken in 1954 at the time of the school's 75th anniversary. The road to the left (up the hill) is Broad Street and the houses all remain today. To gather an understanding of the lives of parents, grandparents and other relations, it is interesting to focus in and look at things such as dress and other themes. The men for instance are all mostly dressed in suits and the women are wearing a hat. Several other items will bring back memories to the older reader. What a fine buggy, pram the child below has. A far cry from todays pushchair models. Plenty of room to sleep and for the older child, a harness was employed to stop them falling out!! The boy on the Tricycle, with its strong metal frame, would have been proudly riding his bike around the grounds! No need for trainer wheels here! The Treasury at Thames are busy cataloguing photographs that have been donated and in the future these will be accessible for viewing. In the interim there are photocopies of many items in the reading room. 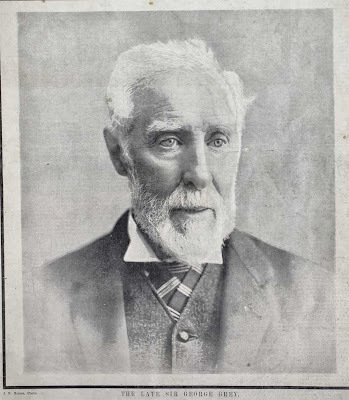 Sir George Grey had a strong connection with The Thames, and always took an interest in the activities on the goldfields. There is a growing collection of digitised items in the MANUSCRIPTS Collection at the Auckland Library. 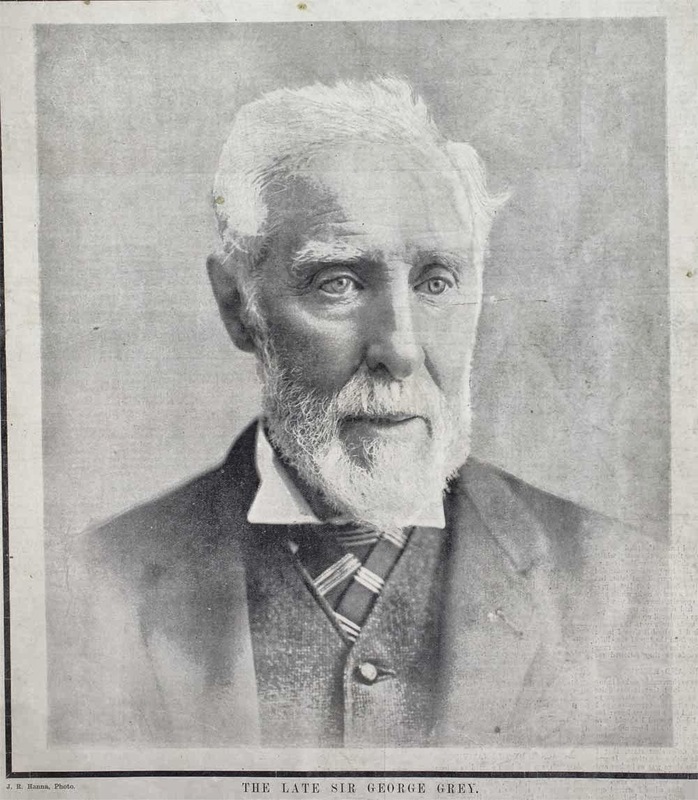 The original Auckland City Library opened in 1880, thanks to the generosity of Sir George Grey who had the foresight to gift his diverse book collection to the people of Auckland. 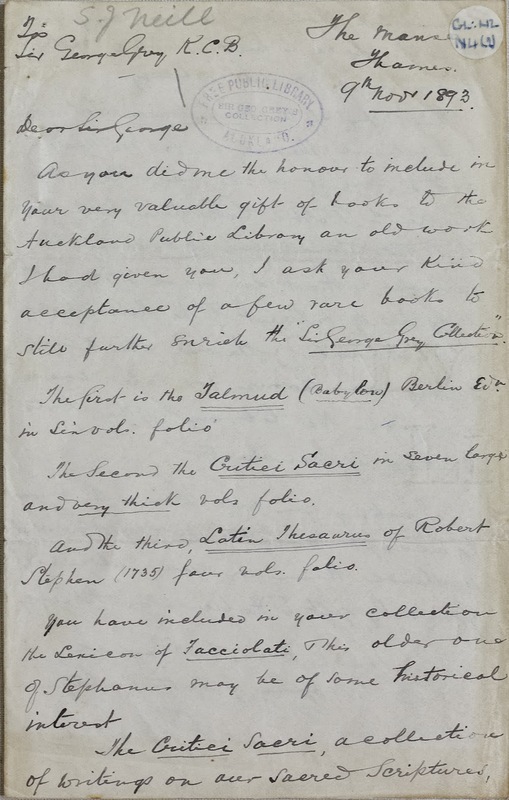 This collection included some 14,000 items including rare books, manuscripts and letters, which today has both national and international significance. The collection has letters relating to Thames. 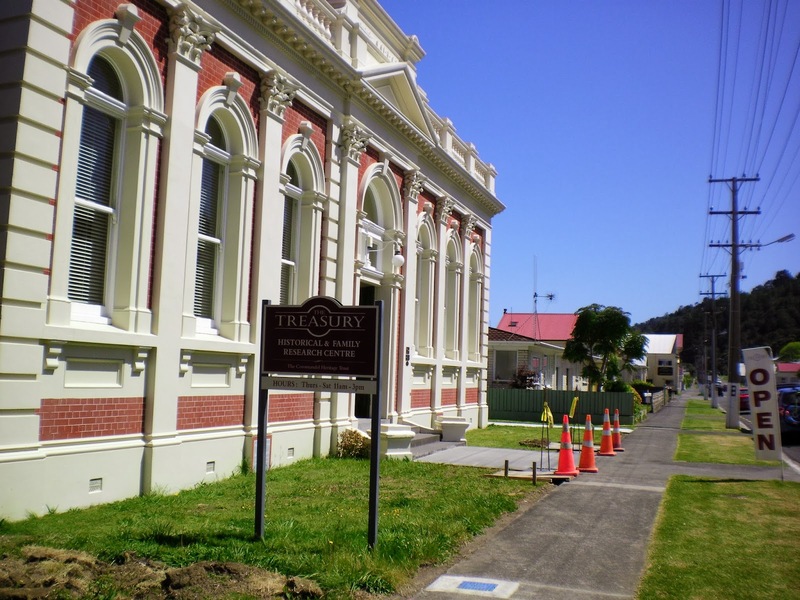 One of interest relates to the donation of books to Sir George Grey for his collection, and the Auckland Library. In 1898, Rev S J Neill of the Manse, Thames, donated several books to the collection. One was a four volume set called the Latin Thesaurus by Robert Stephen, which was published in 1735. Many old books ended up down the mine shafts around the town, so it is pleasing to note that at least these books (among) others survived. Today the book can still be found at Auckland in the Special Collections at the Library. TITLE: Roberti Stephani Thesaurus linguae latinae. Publish info: Londini : Typis & impensis Sam. Harding ad Bibliorum & Ancorae in vico St. Martin's Lane, 1734-1735. Plenty to report today, most noticeably that the construction fence is down. The ground has been cleared and just some wood remains stacked at the south end, by the Queen Street road frontage. 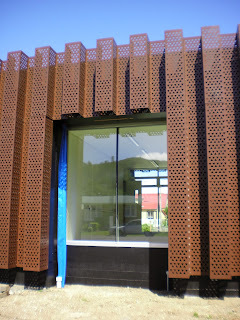 The final touches are being added to the inside of the building. The WW100 Project at The Treasury has begun. We have already had some generous donations of material relating to the JENKINS, MILNE and MCCALL families. Updates have been made to the main WORLD WAR ONE Treasury webpage by Webmaster Kae. There are still a few men to identify so please contact the site direct, if you can help. The area currently being researched for WWI involvement, stretches to the south - TE AROHA. Over the years the mining activities in the area have kept the bonds strong between areas such as Coromandel, Te Aroha, Thames and Waihi. 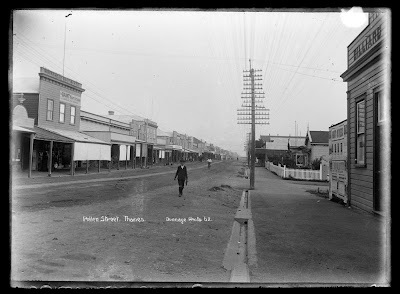 For instance many Thames families have strong links to Te Aroha, mining families that moved from the goldfields to mine or farm around Te Aroha. A new blog has been launched by Andrea, that features the men from the Te Aroha area who fought in World War One. 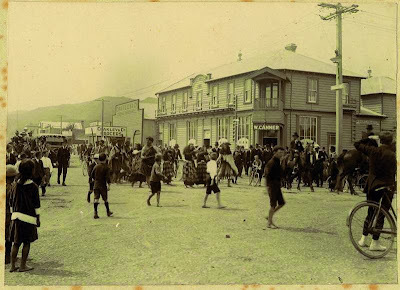 Called TE AROHA - GENEALOGY & HISTORY. Other information will be added over the next months. There are for instance some births for the area. All was quiet outside The Treasury and Archives today, as final touches and painting are being undertaken within the building. 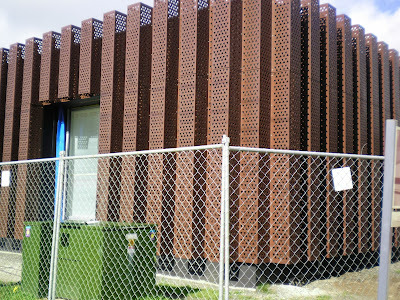 The view below is of the North-East corner of the new building.